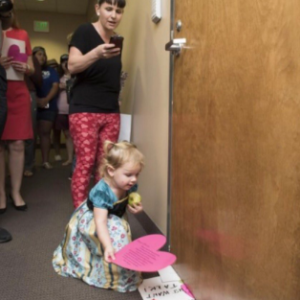 When Megan Blash and her 2-year-old daughter, Lola, arrived at Rep. Dana Rohrabacher’s office to hand deliver a Valentine’s Day card, they were met with a shut and locked door. Rep. Rohrabacher’s disdain for visiting constituents led to Lola sliding her card under his door, which led to a staffer, Kathleen Staunton, accidentally opening the door on Lola’s head and Ms. Staunton’s unfortunate fall. Police were present and no arrests were made. The accidents that occurred to Lola and Ms. Staunton would not have happened had Rep. Rohrabacher’s office simply been open for his constituents, plain and simple. For the past three weeks, hundreds of constituents, like Megan and Lola, have peacefully and respectfully attempted to meet their Congressional representative to share their concerns about his positions on the unconstitutional Muslim and refugee travel ban, the Republican struggles to repeal the Affordable Care Act, and the ongoing dishonesty from the Trump administration regarding its ties with Russia (and Rohrabacher’s own well documented relationship with Vladimir Putin). They too were met with a shut and locked door. We are hardworking, taxpaying Americans who want to engage in our democracy and to simply be heard by our Congressional representative. It is a shame that Rep. Rohrabacher has refused repeated requests to hold a town hall meeting for his district and holds a particular contempt for engaged citizens by characterizing civic duty as “political thuggery.” For all we know, the only political thuggery we see is his Twitter behavior.